Aaaand THAT wraps up the Fate/Stay Night arc of Magic Gunner Rin. Next up, Melly’s (and my!) personal favorite: TSUKIHIME. Hnnnghhhhh. However sad it is to say, though, this arc is not complete, and it seems Baselard has no immediate intentions to pick the series back up. Still in all, it’s an enjoyable ride for what it’s worth, and we hope you stay tuned for part two. 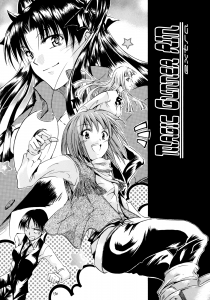 THIS DOUJINSHI! —was typeset and translated by yours truly, and edited and scanned by Melfra. Truly a double-team of epic proportions. 3 Comments on "The Twelve Days of Doujinshi, Day Two: Some Sling Guns, Others Mop"
will there also be updates to your regular series soon (during the twelve days of doujinshi)?